Today is Mother’s Day... my first Mother’s Day :) I can’t tell you how happy I am to wake up today with Chloe in my arms and realize that she is mine and I am hers - forever entwined as Mother & Daughter. Its true what they say though. You can’t truly appreciate your parents until you become one yourself. And today, that knowledge I’ve been given is casting tears on my keyboard as I type. I have always known my mother was an amazing woman... she raised four happy children, built a career, nurtured, supported, cheered, and comforted us, always providing the perfect solution to whatever ailed us. 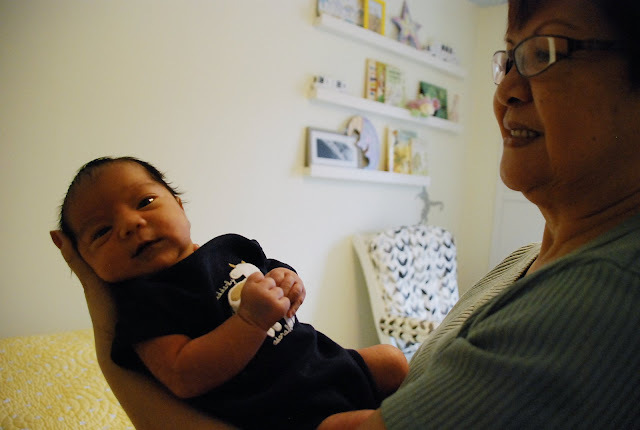 But in the last three weeks, I’ve seen another side of her... as Grandmother, “Lola” to my child, her first granddaughter. Lola has stayed with HandyMan and I the past three weeks, easing our transition into parenthood. Lola has shown us how to bathe Chloe, how to hold her wobbly head properly, how to soothe her midnight cries. She has babied me too, cooking us hot meals, taking Chloe and giving me time to sleep, shower, and blog. She has reveled in her new granddaughter, buying Chloe pretty clothes and putting sweet bows on her head. And when my ‘new mom’ fears arise and I think “I can’t do this. I don’t know how”, Lola is right there to tell me “Yes, you can”. Nothing compares to the sight of your mother holding your child, and singing to them the same soft lullabies you heard as a child. 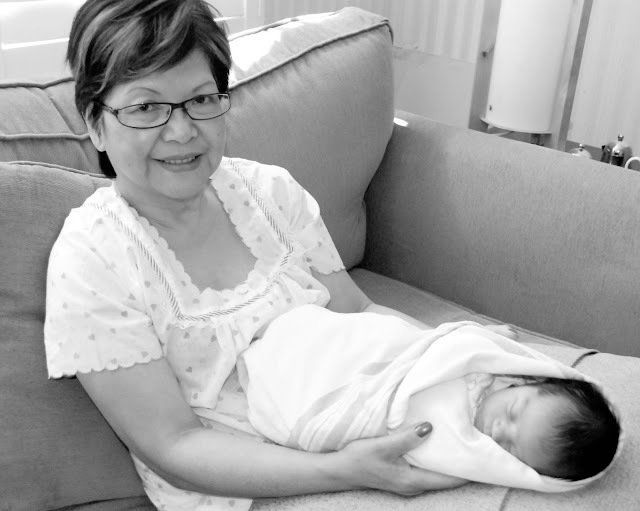 Happy Mother’s Day Lola. I hope I can be as wonderful a mother as you someday. You are truly blessed to have such a wonderful, helpful mother!! Not to mention you sound like a wonderful daughter!! You really do sound like a wonderful daughter and mother. Lola is lucky to have YOU! Happy Day After Mother's Day to you both. and PS) you'll be fine after she leaves too.